The Days of Johann, an agility dog! : More hiking! 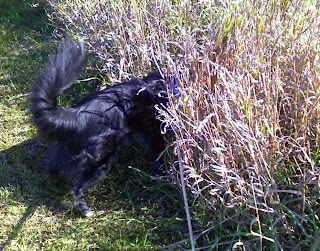 Since I was feeling mucho better, and the weather was just pawsome on Monday, Mum worked super hard to finish up lots of work so we could go on a little hike in the early afternoon. This time, we decided to explore around the big, big church. They have acres and acres of grounds and lots of paths and wooded areas to explore, and it's just a stones throw from our house. 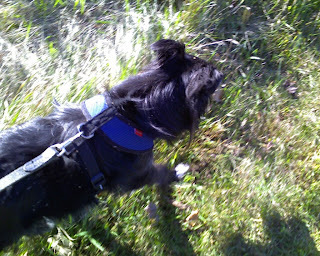 If you remember, that was the place where I took off after a bird off leash last year and scared the begeebees out of Mum. 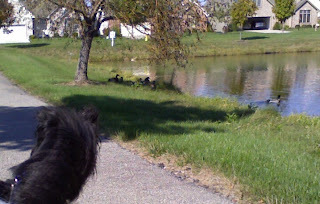 So we ventured out, passing the pond along the way. 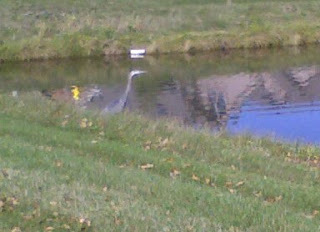 Yep, they they are the ducks and geese, and of course, our friend the heron. 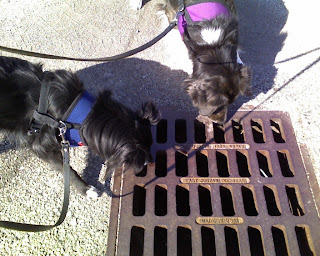 I don't know why, but every time I see a drain, I want to inspect it. On one paw, I'm super apprehensive about them, but on the other hand I just can't stay away. Remind you of anything? After crossing the busy street, we were finally on our way. The beginning of our hike, we crossed a big open field, on our way to the good stuff. 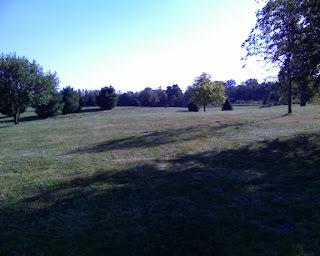 In the open areas of their land, the church has mowed a bunch of cross country running paths for the school kids. And some of them were out practicing today, so we stayed off the mowed paths, and kept to the open areas. 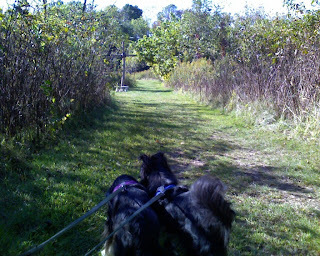 Then we finally made it to the wooded areas. Oh the smells were pawsome! And we know there were lots of racoons, bunnies and more around. This is the place where last year we saw the Red Fox, but he was no where to be found today. 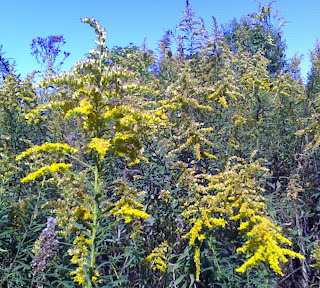 We saw some Golden Rod, which some folks are super allergic to. Not us though. 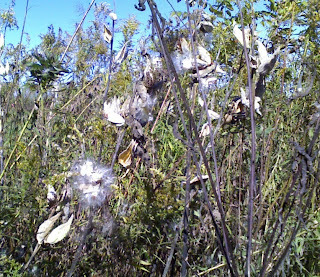 Came upon some MilkWeed, super cool how they just explode at a certain time of year. We kept on the path, this part is the widest part. Found some Bull Thistle in bloom. I think that's what it is. If Mum remembers from her younger years, it comes in a variety of colors. Here's the purple. 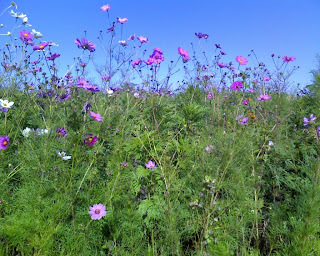 Then we came upon an area where they had planted a slew of wild flowers. Reminds Mum of those canisters you can buy and sprinkle an instant flower garden. But it was beautiful! What a great day - well fur us, not the bird! Feels pretty darn good to feel good again. Mum feels the same, she worries too much about me, when I hurt. Thanks everyone for all your super great wishes...means a lot! Oh noes, the hawk dinnot eat the burds wot was in your window the other day, did he? Bad hawk! We had one do that in our yard last year and mom yelled at him to get over to the park. He did and we has not seen him again. 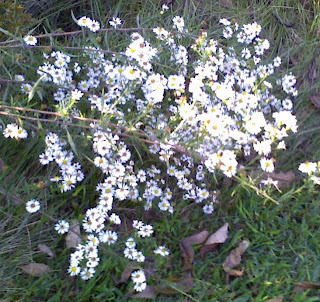 Great hike you had there with lots of beeootiful flowers. Some of them looks like wot we has here and some is different. Great hike, Johann! I am so glad to know that you didn't take long to recover from your muscle strain/back ache thingy! You must be in very good shape these days! 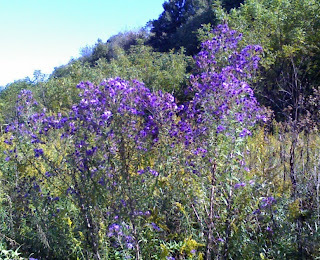 Very pretty wildflowers - mom loves that kind of stuff. Poor bird - that happens in our yard a lot. What a great hike Johann! 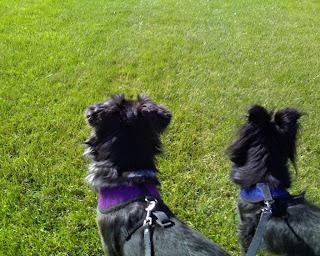 You and Gracie need to chase that mean old hawk a way...poor birdies! As fur Mr Hawk, well, he doesn't have akhcess to Petsmart SO he has to make do with what Mother Nature ofFURs! What a fun hike, you saw so much stuff! We have a neighborhood hawk. Mom has seen him carry a bunny off somewhere as his dinner this summer. Last week he was seen perching on our deck railing -- he's huge! Oh wow I just saw those videos of Marcus and Sylvia. They sure make it look easy don't they? What a beautiful place to hike, and I'll bet there were some great smells. I have to say, my Australian heart was beating fast at the expectation there would be deadly dog-killing snakes hiding in the grass, but I guess it's not such a huge issue over there. Poor bird, but I guess something had to die so the hawk could live. Johann, thanks for coming over to my blog and telling me that beans can be used in a diet to lose weight. I'd like to ask you whether the beans are cooked or raw, and, if raw, do you put them through a juicer or food processor? Hi Parlance :) Thanks for stopping by...we're gonna be posting about another walk this week, fun stuff! We feed Gracie green beans a lot, she never seems to be satisfied and has to stay slim. We actually lightly steam green beans and carrots before we give them to her, because we have heard that raw they can be a little upsetting to the tummy, and that when lightly steamed it somehow helps us pups get more nutrition from them rather than if they were raw - probably has something to do with how they are digested. Gracie got a lot more green beans and carrots when she first came to live with us, now they are occasional treats because she is all slimmed down - and she absolutely loves them! I hope Penny likes them too :) Let us know, K?